One of my ultimate favorite things about homeschooling is our ability to follow our children’s interests. These rabbit holes of learning are akin to the rabbit hole that Alice fell down when chasing the infamous white rabbit. One never knows where you’ll end up. So it is that I’ve discovered maps are a fantastic way to aid us in our learning adventure! *Disclosure: This post may contain affiliate links. Please read my disclosure statement for more information. I received access to Pin It Maps USA and US History Bundle as well as the Europe, Asia, and World Map sets at no cost in exchange for a review. I actually approached Sara at Pin It Maps because I thought the maps would fit perfectly with our family. A positive review was not required. As always, all thoughts and opinions are my own. I only choose to share resources that I would use with my own family and those that I believe other families will enjoy. We love Pin It Maps! Maps are a marvelous item to strew. Strewing is the act of placing interesting resources like books and games about your home that are a part of your children’s interests. Pin It Maps are by far our favorite! 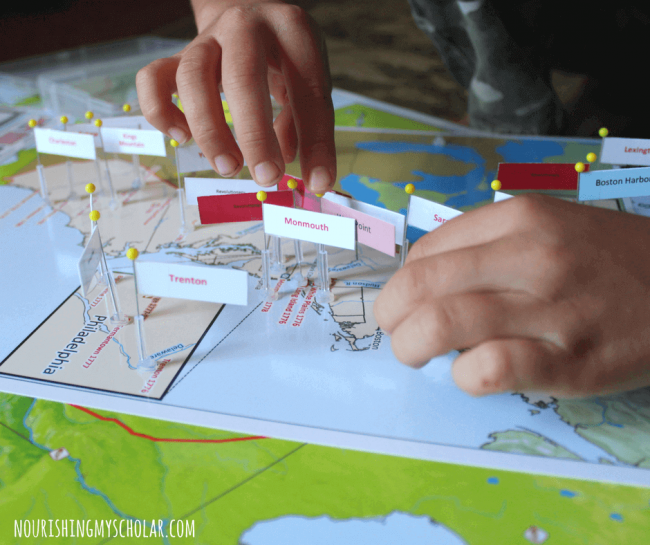 My son is currently interested in the Revolutionary War…which was pretty perfect because the USA and US History Map Bundle contain a map specific to the Revolutionary War and the Thirteen Colonies! On the 4th of July, he pinned the Thirteen Colonies and key Revolutionary War battles to the map and noticed that the English had infinitely more victories. So how did America gain her independence? This brought up the topics of military tactics, weapons of the time period, spy networks, tea parties, and midnight rides. Thank goodness we had several books and documentaries to reference. We even played the Scrambled States of America game! It was a full day of effortless learning and it all started with a map! 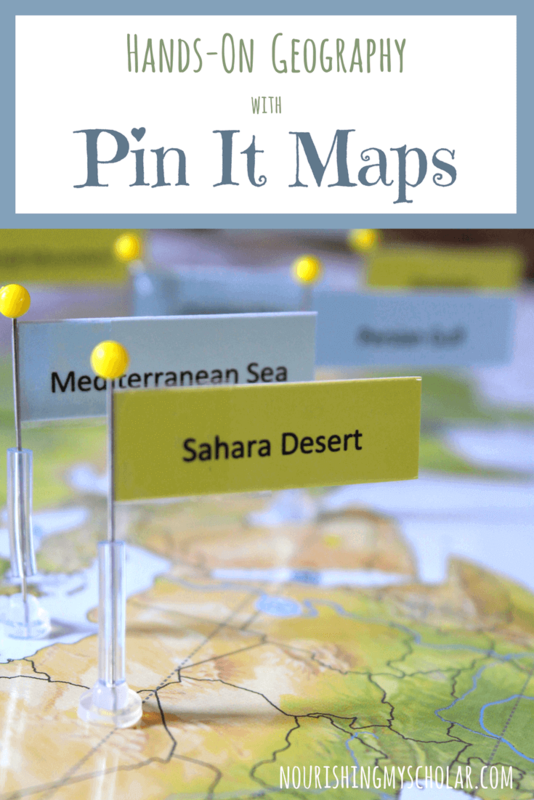 Pin It Maps was created by Sara, a fellow homeschooler. 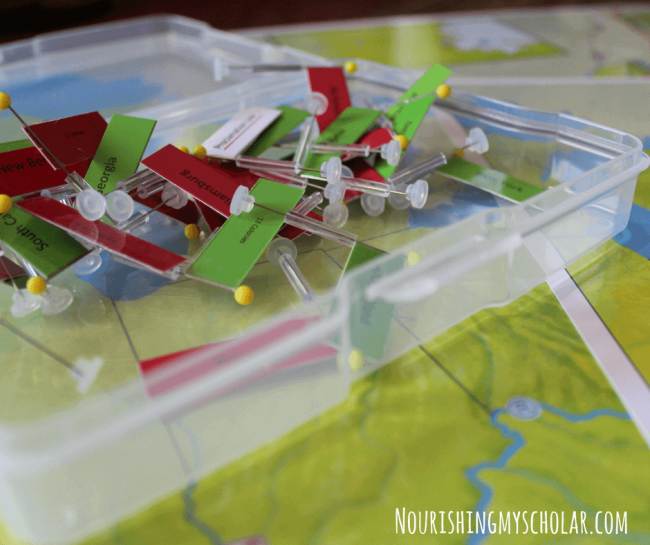 Sara wanted to provide her children with Montessori pin map material but found them out of her budget. So, she set out to create her own high-quality, yet affordable Montessori-inspired map materials. 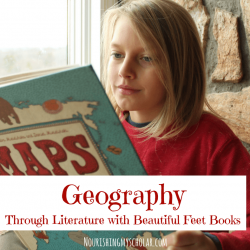 Sara believed that through hands-on exploration of maps, children can learn geography. Exploring with their hands takes on a new depth of meaning as they become explorers of the world. There are infinite ways to use these maps. I strew them at different times throughout the week. The Europe map pairs beautifully with the Around the World Stories we enjoy so much and the Asia map was useful with our History Unboxed all about the Islamic Empire. They can be used for a variety of age ranges. My 4-year-old enjoyed pinning the world continents and oceans while my 10 year old loved pinning key battles of the Revolutionary War as well as landforms across Asia! 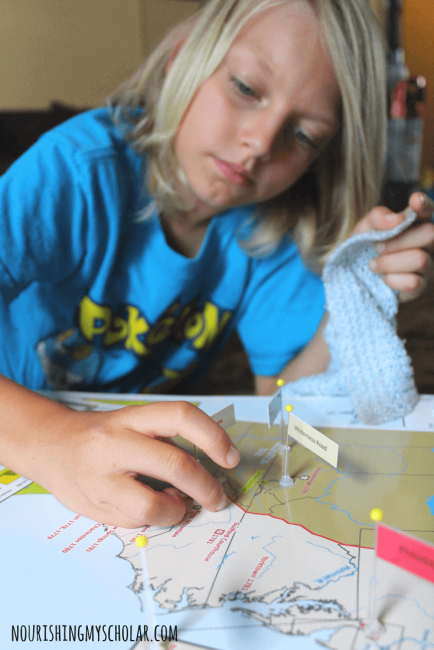 Pin It Maps provide a creative way for children to learn geography and works beautifully with our child-led education. 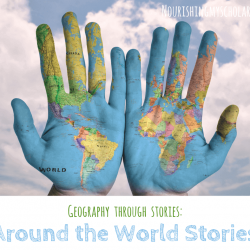 You can incorporate History, Social Studies, and Science with these maps! We tumbled down a rabbit hole all about the Earth’s water and with the help of our maps discovered…. Lake Baikal where the only known freshwater seal lives. They are completely landlocked and scientist can’t figure out how they ended up there. Israel which has some of the only plants that turn salt water into fresh water. The Gulf of California which contains the endangered Vaquita, a species of porpoise. The damming up of the Colorado River may be contributing to the severe decline and extinction of the Vaquita. Do you see how one new discovery leads to another? How it works is that you will have “pinning” maps and control maps. The control maps give you the answers as to where to pin your flags on your “pinning” map. Children can pin to the large map while referencing the control map. Here is an example of what you receive with the USA and US History Map Bundle…which allows your child to pin US water and landforms, 14 National Parks, Civil War and Revolutionary War battles, Westward Expansion trails, States, Cities, and State flags! Did you see that even the tape you need to assemble your flags is included? There are two things you’ll need to purchase separately though…trust me. 1-3/4-Inch Quilting Quilter’s Pins – the pins are for assembling your flags, although for small children you don’t need them. If you want the flagpole, you must assemble them. All materials with the exception of the pins are included. Large Photo Keeper With Small Photo Cases – If you want to be organized then I recommend photo cases for keeping all of those assembled flags together. The USA and US History Map Bundle will have 557 flags that you’ll need to store somewhere! This was perfect for our bundle and it makes for easy cleanup and storage. 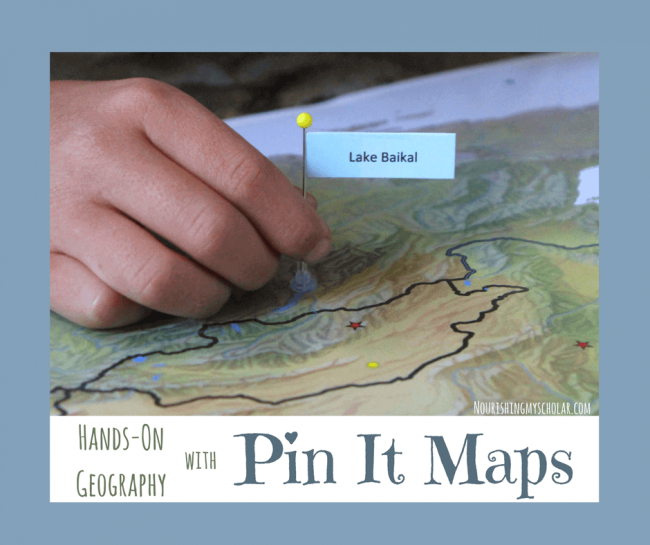 You can learn more about Pin It Maps and all of their map bundles on their website. Pin It! Maps is offering 10% OFF your entire order with coupon code: MAPS at checkout. Isn’t it beautiful the things you discover when you follow thoughts and interests? 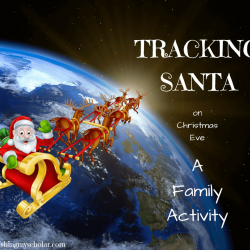 These maps are a fantastic resource and there are so many ways to use them in a way that will captivate your children. 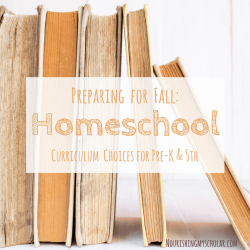 They have earned a special place in our homeschool lifestyle. The sky and your imagination are truly the limit! What sort of rabbit holes of learning have you and your kids tumbled down lately? I love hearing about products that were created by other homeschoolers! Definitely checking out Pin It Maps for the upcoming year!